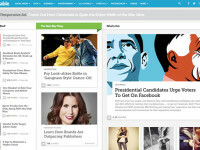 Mashable is one of the many blogs my co-workers and I read daily for the latest in social media and technology news. Yesterday when I visited the site, I noticed right away there were some big changes. The site now has three columns of articles. Stories now begin the left hand column called “The New Stuff.” As they become more popular, they move to “The Next Big Thing.” Finally, those with the most social engagement move to “What’s Hot.” These columns are designed to help readers stay “ahead of the curve.” The redesign also introduces some innovative features including allowing readers to share only portions of a page’s content, infinite scrolling, embeddable content and Pinterest-inspired images on the homepage. Perhaps it just an initial resistance to change but I’m not a huge fan of Mashable’s redesign. I like some of the new features, such as sharing “microcontent” and embeddable content for better sharing but I find their new homepage much more cumbersome to navigate. The three columns have story blocks sized appropriately according to their “popularity.” I can see the logic behind such a move, but the different number of sizes makes the page look unsymmetrical. Also, I know Mashable joined the Pinterest bandwagon, but I’m not sure why, as it is the content on the site that I find most valuable, not the pictures. So why have such a focus on images? Further, the images and headlines are no longer nicely aligned, making it harder for me to quickly scan titles for the stories that interest me. According to Cashmore, a sophisticated algorithm decides which stories go in which column. Unfortunately, this algorithm cannot possibly accurately predict what stories every reader will find interesting. Just because there is a lot of social engagement around an article doesn’t mean every Mashable reader will want to read it. I read many pop culture, travel and social media articles on Mashable that have low engagement just because I find the topics interesting. Now it is harder to find these posts because of the focus on images and articles that don’t interest me. That makes me want to read the blog less. Do you agree? Do I just need to become accustomed to the new design? Feel free to let me know in the comments below!